BJCE Australia is excited to offer tours of Gullen Range Wind and Solar Farm.Come and see how it works. Get up close to a wind turbine and a solar array. Find out more about renewable energy. Stretching from north to south, the wind farm measures 22km, approximately centred on the locality of Bannister, 11km south of Crookwell and 32km north west of Goulburn. The solar farm is co-located within the existing Gullen Range Wind Farm and occupies an area of approx. 28 hectares. Download the 2019 tour brochure here. You will be met at the Crookwell Hotel Motel, from there our staff will take you on a tour of the wind and solar farm in a 24-seater bus. You will be able to see how our wind and solar farm works, learn about renewable energy and get up close to a wind turbine and a solar array. The tour is two and a half hours long and includes complimentary light refreshments. 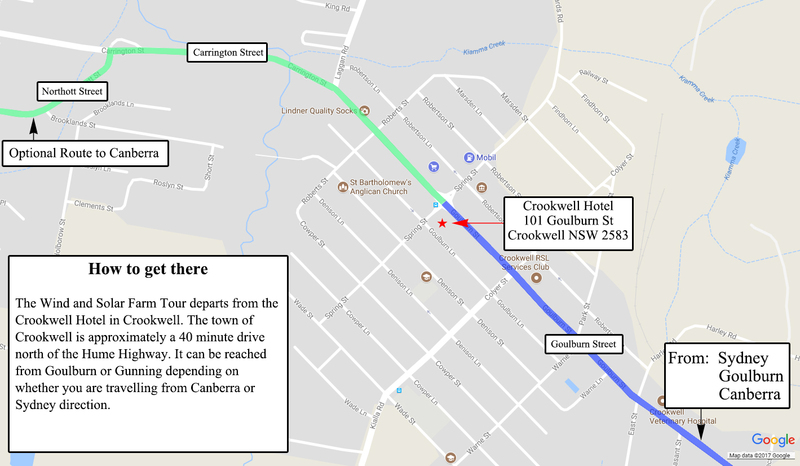 Guests should arrive at the Crookwell Hotel Motel Bistro in Crookwell by 11:15am. The tour bus departs promptly at 11.30am and returns at 1.30pm. Guests are welcome to enjoy a complimentary coffee or tea before the tour. A light lunch is served when you return. There are limited spaces, so book early to avoid disappointment. The tour is free and complimentary light refreshments are available at the end of the tour. In the unlikely event the tour is cancelled, Gullen Range Wind Farm will notify you by phone. If you have any questions, please contact us. Please fill in the booking form here. Bookings for the next tour will open one week after the previous tour. Crookwell is located approximately 45km from Goulburn, NSW. There are several travel options to get there. A map showing the tour pick-up point can be downloaded here. Parking is available on nearby streets. For information about catching a bus from Goulburn to Crookwell, check out the bus link here. Whilst in Crookwell, you should consider visiting the impressive local attractions. For more details, visit Crookwell Tourism here. We encourage guests to bring children on our tours. There is a colouring-in competition and word search they can complete along the way. Parents are asked to supervise their children closely at all times. As you will be visiting an operational wind and solar farm, guests are required to wear enclosed, sturdy shoes and appropriate clothing for all weather types (sunny, rainy and/or windy). Please note: there are no toilets on the minibus however guests can use toilet facilities at the wind farm and at the Crookwell Hotel Motel before and after the tour. If you require special assistance, please let us know on the booking form and we’ll see how we can help. Please take the time to read and understand the conditions of booking set out below prior to booking a tour with us. We strongly recommend that you also read the welcome sheet relating to your tour prior to booking to ensure that you understand the itinerary, style and physical demands of the trip you are undertaking.